The April team continues, and continues to grow as we welcome arriving members. Vivienne arrived today to assist Lalima and the staff with training and professional development. Her skills in management and teaching are a resource of immense value here. It is such a wonderful blessing to have folk volunteering their services to grow the ministry in these ways. Today was church day and we enjoyed a great service with the lovely people of HCM. The worship team led a time of singing then Pastor Raju brought a message on interpersonal relationships. His dynamic and animated delivery of his sermon had the congregation in tears, in fits of laughter and deeply pondering the truths of scripture. Pictured is Pastor Raju in full flight and Jiban (G1) leading singing. More storms thundering through the valley again today. Today's storm was very windy but with very little rain to clean away today's dust. Windows and doors crashed shut throughout the streets and loads of rubbish were lifted and blown all over the place, dumping another thick layer of dust everywhere. Netra was stuck at the airport collecting additional team members during the storms and came home wet and somewhat frazzled, having been sheltering under iron holding on for dear life while waiting. So what do you do if you're stuck inside late in the afternoon while the wild weather passes? Play word association games? 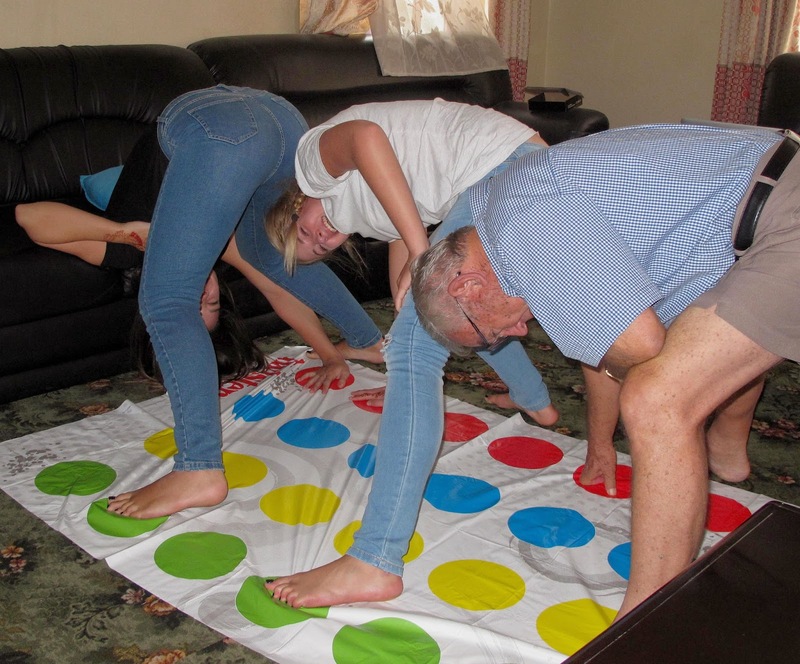 No, you play 'game' associated games...Twister of course...No one is sure if their tenderness is from falling over or falling about the place giggling. Either way they had no trouble passing the time till dinner was ready. Nepal showcases people's initiative and willingness to earn a living despite their circumstances. Walking between the guest house and the groceries or catching the taxi back from church you get to see some of the ways the locals etch out an income. In both of these shots the amount of weight involved is amazing. The poor guys delivering gas on push bikes spend so much time walking the weight up the hills. The gas bottles appear to be around 30kg's each when full! Tonight during discussion time it was decided that we will all rise early in the morning and read in a round through selected passages of scripture to honour Jesus at this Easter remembrance time. We chose this start time to coincide with the approximate time the women would have made their sombre trek to the tomb according to Jewish culture. This will be a wonderful start to prepare us for another busy day. We welcome Venus and Simon this evening to the guest house. These guys are educators and school missions coordinators from Hong Kong, looking for possible involvement with Transform the Nations. The Lord is using his saints from all corners of the globe to empower the work being done.